A unique feature of this panel is a vertical leg that is a side joint that is mechanically seamed with an electric seamer for a weather tight finish. This panel features concealed clips and easy to handle 16″ wide panels custom cut to the desired length. This panel can be installed directly over purlins or bar joists. It does not require a solid substructure for support. This roof system has several different UL90 construction numbers. Fasteners: A choice of concealed fastening clips is available for this panel system including UL rated clips. These clips hold the panel firmly in place without unsightly exposed fasteners. Each clip system offers the ability to accommodate thermal movement. Usage: This panel is a structural panel that spans up to five feet on purlins, or can be used as an architectural panel over solid deck. This flat panel is designed with striations as an option to minimize oil-canning. It is designed to meet the ever-changing specifications and other industry codes. 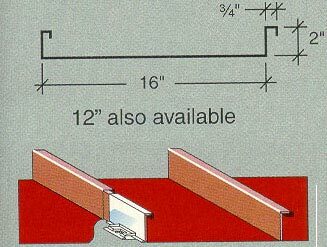 Limitations Recommended for roof slopes of 1/2:12 or greater. Oil canning is not a reason for rejection. Factory applied mastic inside of female leg of panel is standard. Watertight and Easier Erection. Swaged End Laps Improved erection & improved appearance. Optional: Heavier gauges, striation and embossing. Minimizes oil canning. Roof runs without end lap panels maybe erected from either direction. Flexible and convenient erection. Roof to wall transition. Creates a trimless eave. 80% less exposed fasteners than traditional side lap panels and all fasteners are long life. Increased weather tightness & improved appearance. The side lap has been tested for air infiltration and water penetration under ASTM E283 and E331 methods. Minimal air infiltration and water penetration and acceptability among specifiers. Vertical Leg Better transition to hip, valleys, and roof openings. Insulated with thermal blocks. High energy efficiency system. High or low floating clips available. Allows roof to expand an contract maximizing weather tightness. High or low fixed clips available. Varying insulation thickness available. Oil-Canning Note: Oil-canning is not considered grounds for rejection of any panel system. Oil-canning can occur in any panel with wide flat sections. Heavier gauge, embossing, striations, flatter sub-frame systems and support from a solid sub-deck can all help to minimize oil-canning.